I am starting to be concerned about hiking with Obsession? woops, my mistake. Allow me to restate. I will bring a map and a couple of bucks for beer. If you climb mountains, no explanation is necessary, if you don't , no explanation is possible. My notes from '89 are very much similar to Jack's that Robert posted above. We did work our way down and out onto the Smoky creek plain on the left/south side without any trouble but we may have stayed higher as we were working our way back around the front of the escarpment back to Smoky spring at about the 3200' level. I too never met Jack but he was one hell of an explorer and always very kind and exact in his sharing of information about the park. So it sounds do-able but a little scary for a solo hiker, in other words perfect. I don't know where the name Sugarloaf Mountain came from originally (maybe Ross Maxwell?) and I couldn't find anything on it when I googled it. But it does resemble a loaf of bread when viewed from the high dry pass which connects Fisk Canyon to the Smokey Creek Trail. Perhaps I just made this name up myself or heard someone else on this page use it? you are right, I found Sugarloaf Mtn. on the maps in Ross Maxwell's "The Big Bend of the Rio Grande". 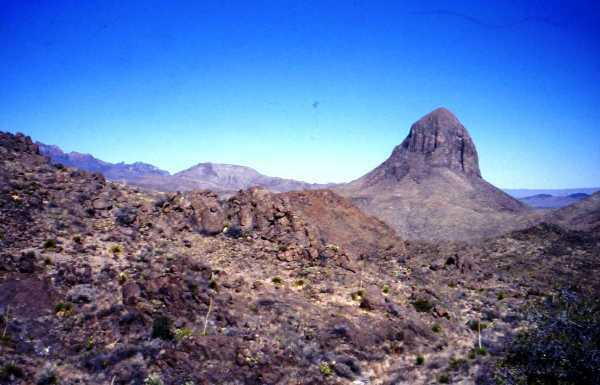 It is a very distinctive flat topped peak. As to the walk down and around "the cut off canyon" you'll be fine as long as you don't have your 80 pound pack full , even then it should be no problem. If you mean the Dominguez Mtn. pass to be the area between 5156 (Dominguez) and 4586 past the point 4226 where the topo shows an area of green (sorry no trees there) Over the top (great views of ET and Backbone), just west of 4226. Sorry for the quality, old slides scanned in. That's a good view of the seldom-seen West side of the Tusk. that would be one hell of a day from Smoky spring back to the ET campsite south of the Punta de la Sierra. Looks like 20-25 miles. You can certainly do it, the brush is no problem at all, widely spaced creosote and prickly pear, fast walking. 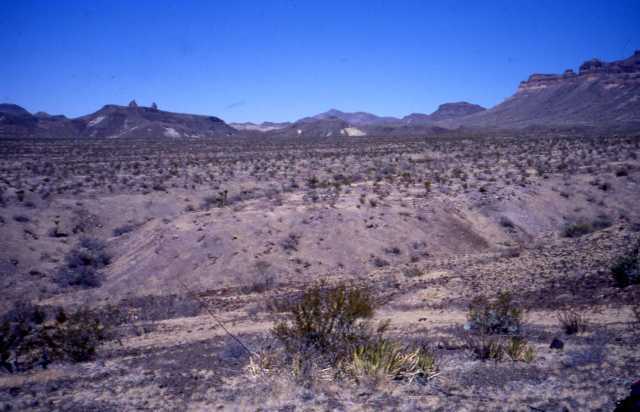 The area just south of San. Jacinto spring is a bad lands type with hills of volcanic ash. You will need to swing south of two points of hills coming out from the Punta one SW of pt. 2725 and the next south of pt. 2839 then head straight to the north of Cow Heaven Mtn. This picture is taken from near the first set of hills (see above) SW of pt. 2725, looking NW. You can see the points of the Mule Ears on the left. The San Jac. wash comes through the low gap in the middle. I believe the flat topped peak on the middle right is TWWG's Sugarloaf Mtn. Sounds like quite a loop. ET campsite north around ET down to and over Dom. Mtn., then Jacks' Pass to Smoky spring? or north up Fisk canyon and down Smoky Creek cutoff to Smoky spring? How many days?